THURSDAY, Oct. 9, 2014 (HealthDay News) -- Cold temperatures may prompt unhealthy white fat in the thighs and belly to turn into brown fat that burns calories for body heat, a new study says. 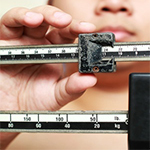 But being obese appears to hinder this process, according to researchers. Most adult fat deposits are what's known as white fat, and it was once believed that only babies have brown fat, which appears to help keep them warm. Previous research suggested, however, that adults also have some brown fat. Then a study published in 2012 by researchers at Harvard determined that the brown fat found in adults isn't the same as brown fat in babies. Brown fat in babies arises from muscle, but brown fat in adults is actually a "beige" fat that occurs from the "browning" of white fat, the Harvard team explained. For the new study, a team of researchers led by Dr. Philip Kern of the University of Kentucky School of Medicine compared belly fat taken from 55 people during the summer and the winter. They also examined thigh fat collected from 16 people after they held an ice pack on their skin for 30 minutes. Belly fat taken from people in the winter had higher levels of two genetic markers for brown fat than belly fat collected in the summer, the study found. The thigh fat taken after people placed an ice pack on their skin also had higher levels of three genetic markers linked with brown fat, the researchers reported. However, these brown fat-producing effects were blunted in obese people, according to the study released Oct. 9 in the Journal of Clinical Endocrinology & Metabolism online. "We wanted to investigate whether human adults had the ability to transform some white fat deposits into beige fat when they were exposed to cold," Kern said in a journal news release. "Browning fat tissue would be an excellent defense against obesity. It would result in the body burning extra calories rather than converting them into additional fat tissue," he added. Kern said the findings "indicate inflammation can hinder the conversion of white to beige fat." Prior research has shown that brown fat prevents obesity in rodents, according to the researchers. And several past studies have suggested that cooler temperatures may help burn calories in humans, including one study that suggested the effect might be linked to brown fat. But for now, the research is preliminary and experts say it's too soon to know if cold temperatures would have much of an effect on weight in people.